Who needs a remote finder, after all? Losing the remote will no longer be a problem: Starting today, the Google Home Mini, Google Home or the new Google Home Hub can now change the volume, turn on or off and start certain channels on Roku devices – all using voice commands. Roku says the list of supported devices will include both its line of Roku players that include the Roku Ultra, Roku Premiere and Roku Express, but also its expanding lineup of Roku TVs from manufacturers like TCL, Hisense and more. 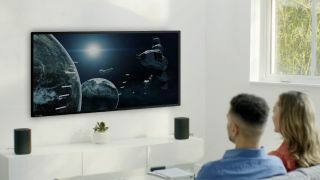 Based on the example commands listed on a press release sent to TechRadar, it sounds like the functionality won’t be as deep as the one you’d find on, say, Google’s own Android TV platform - wherein you can start specific YouTube videos with a simple command - but even basic functionality will be appreciated by those who enjoy both Roku and Google’s platforms. To connect a Roku player or TV to your Google Assistant, all you’ll need to do is go into the Home app on iOS or Android and add a new device. Search for 'Roku' and then link your Roku account. The caveat here is that only devices running Roku OS 8.1 are compatible with Google Assistant and, if you have two players or TVs in the same room, only one can be controlled via Google Assistant. While Roku has yet to comment on when, exactly, we're going to see its smart assistant (called the Roku Entertainment Assistant), Google integration could be a good stepping stone for folks who aren't familiar with the idea of voice control.